PlayerUnknown's Battlegrounds has grabbed a lot of gaming news headlines in recent days. This hugely popular last-person-standing shooter surpassed 500,000 concurrent players on Steam a few days back. That's an impressive figure, especially for a game still in Early Access. In the concurrent plays league table it is only currently beaten by DOTA2 after aggressively elbowing CS:GO aside. These three games are leagues ahead of the rest of the top ten. 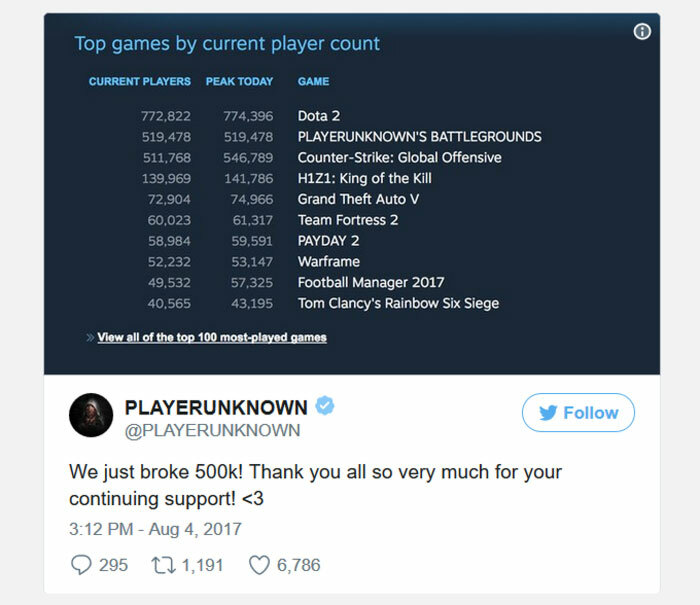 Another recent story doing the rounds about PlayerUnknown's Battlegrounds concerns the market price of fripperies such as character costume sets. Eurogamer notes that in particular attempting to buy a purple miniskirt for your character requires very deep pockets. As you can see above this item of apparel costs over £300 on the Steam Marketplace with many willing to put in bids over £200, if any further folk have one they wish to part with. That's not all that seems to be attracting crazy money. A previously free to gamers PlayerUnknown Set crate is now selling for £687.25 with thousands of people willing to cough up £590 or more to secure one of these virtual boxes containing a selection of bandana, trench coat, shirt, pants and boots designs. UPDATE: At the time of writing the Bandana has become the single most expensive piece of clothing in the marketplace at £315. 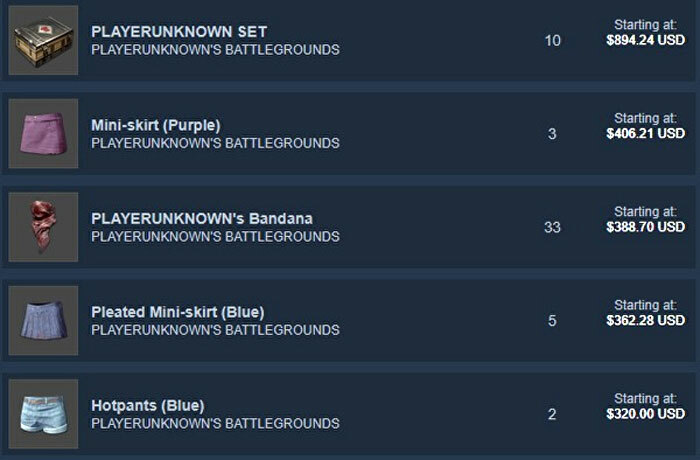 The above prices might sound exorbitant but there is a Butterfly Knife, for example, listed on the CS:GO Steam Marketplace puts the PUBG fashion accessories in the shade. Probably more important to many gamers is the news concerning a patch with program optimisations and bug fixes, which started to roll out yesterday and will continue today. The Week 20 Update contains both optimized game performance for 6-core or higher CPU and a new optimised UI. 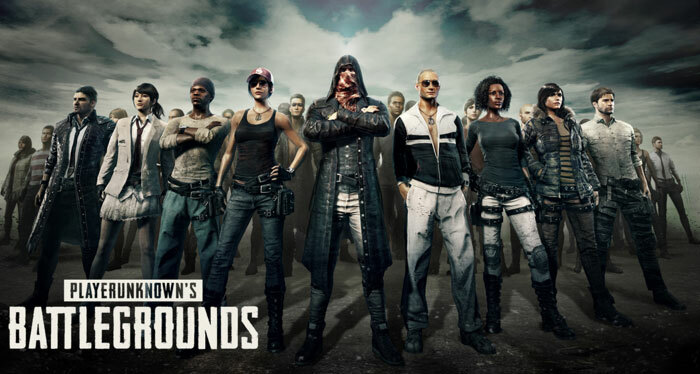 Good multithreaded performance should help make for a smooth gaming experience in PUBG, as sessions can have up to 100 players running around the ever contracting map at the same time. Its good timing from developer Bluehole, Inc. as both AMD and Intel release new, modern CPU sporting many more cores and threads than were available to consumers last year. As a reminder, Intel is just days away from revealing its 8th gen Core CPU lineup, and only a few days earlier fully revealed its HEDT Core-X Series processors. AMD Ryzen processors for desktops have been available for some time but they are soon to be joined by even beefier many-multi-core HEDT AMD Threadripper CPUs. Nvidia driver 425.31 enables DXR on GeForce GTX 1060 and better MSI GL63 laptop with GeForce GTX 1650: promo slides shared Intel Core i5-9400 PC Specialist Vortex S1 Has Samsung been chosen for Intel Xe GPU manufacturing? Hopefully this will start to get other studious to do the same to their games. Yeah,I mean the recent DF Ryzen 5 1600 vs Core i5 7600K article was very interesting indeed - in a number of newer games the Core i5 was getting bogged down during more intense scenes and then shooting ahead when stuff was less intensive on screen….! Good to see the PUBG dev is actually trying to support the new mainstream AMD and Intel CPUs. You basically missed the whole point of multicore threading. There is a definitive curve right now that for a vast majority of scenarios having a low thread count will impact performance but then there is also a performance drop off curve that as you increase the core count you don't get more performance. Using multithreading to distribute the processing requirements is getting more and more needed in applications and games, especially seeing as they've pretty much hit a frequency stability limit on the silicon semiconductors. So next is increase the core count.